Join Ascend at it’s next fundraising event, an Equinox Celebration with Alice DiMicele, taking place on March 24th at the North Fork Grange in Junction City, CA. Doors open at 7pm, music at 7:30pm. Ascend will be selling concessions and promoting our new membership drive. Consider becoming a “Friend of Ascend” by offering an annual donation. We have many perks depending on the level of commitment you decide to join the membership with including advertising on our website, a 10-pack of high quality gift cards with photos of the Trinity Alps Wilderness, and more! Come find us at the concert for more details. 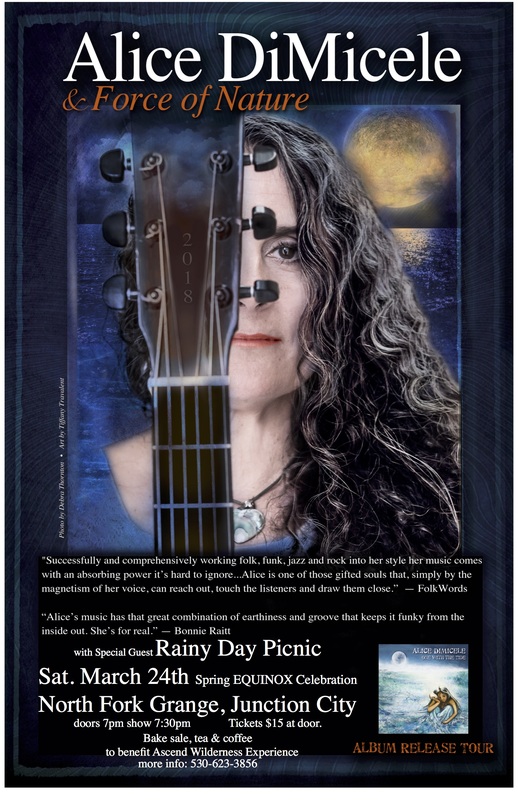 Alice DiMicele and her band “Force of Nature” celebrate the release of Alice’s new album “One With the Tide.” Force of Nature features Alice’s longtime bassist Rob Kohler and drummer Nick Kirby. Alice DiMicele is a singer/songwriter and acoustic guitar player that seamlessly works jazz/blues phrasing and R&B and rock & roll rhythms into a broadened Folk/Roots/Americana sound she calls “Organic Acoustic Groove.” Whether playing solo or with her band, Alice brings her wide-ranging vocal prowess, humor, and distinctive guitar style to festival stages, theaters, clubs, and house concerts. For over 30 years Alice has been a grassroots trailblazer in independent music. Bucking the advances of record labels early in her career–she has self-released 14 albums on her Alice Otter Music label including 2018’s “One With the Tide”. DiMicele has stayed true to herself and her mission: to create music that connects people and inspires them to take a stand for the earth and for justice in the world. Born and raised in New Jersey, and firmly transplanted since 1986 in the fertile Southern Oregon soil, DiMicele’s music encompasses both city savvy and country innocence.